888-671-5387 and one of our Aviation Specialists will help with your request. 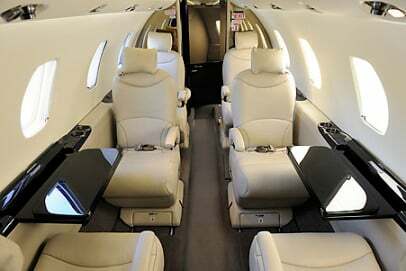 The cabin of the Hawker 900XP is typically configured with eight seats: a four-person club section, a three-person divan, and one forward-facing seat. The seats are fully adjustable and can swivel 360°. The cabin itself measures 21.3 feet long, 5.8 feet high, and 6 feet wide. There is a baggage compartment accessible in-flight which holds 48 cubic feet of luggage. The seats are fully adjustable and can swivel 360°. Different soundproofing options are available, but cabin noise levels usually stay in the low 70-decibel range. The cabin itself measures 21.3 feet long, 5.8 feet high, and 6 feet wide. There is a baggage compartment accessible in-flight which holds 48 cubic feet of luggage. The Citation Excel’s cabin holds eight passengers in a cabin that’s quiet and draft-free due to the triple-sealed entry door and triple-pane windows. Citation Excel charter is comfortable with a 5.7 feet high and 5.5 feet wide cabin, which is about average for a mid-sized private jet. With the incomparable Citation XLS, we’ve taken the world’s best-selling business jet and made it even better. Among the enhancements are some of the industry’s most desired avionics, full-authority digital engine controls (FADEC), an upgraded cockpit, wider passenger seats and a more streamlined profile. Citation XLS charter allows you to do for your business swiftly and surely to the next level and beyond. The interior of the Citation III was designed to look and feel like the interior of a much larger, more expensive private jet. The cabin of the Citation III has a volume of 438 cubic feet and is about 5.8 feet high. Special headliner lighting and window design provide bright, indirect lighting, giving the cabin a spacious, open feel. The cabin holds eight passengers in seats that recline, swivel, and have adjustable armrests and footrests. The Citation VII is designed to be economic, high-performing, and comfortable, and they consistently stand out in the market. Experience the best jet charter Citation has to offer with the VII, which is the updated version of the Citation VI. It uses different engines to increase cruise speed and takeoff performance. The cabin is more comfortable and has improved design options and increased soundproofing. The Falcon 20-5 is the result of tweaking and perfecting the existing Falcon 20 midsize business jet. When first manufactured, Dassault’s line of Falcon 20’s fell short on power. Dassault re- engined the Falcon 20’s not once, but twice. The Gulfstream 100 was designed to fly long distances at high speeds. It can easily complete nonstop trips from Seattle to New York or from Singapore to Tokyo and has a maximum cruise speed of .84 Mach. The Lear 60 incorporates successful elements of former Learjets, while adding a few design modifications of its own like a larger fuselage. Although its predecessors were competitive, Lear essentially produced the 60 to contend in a growing business aircraft market, namely one with greater cabin accommodations. The Lear 60 charter experience makes private jet flight fast, spacious and efficient.